I cannot believe I just recently discovered the greatest gadget of my cooking career that, get this, has literally been in a box in my pantry for over five years. 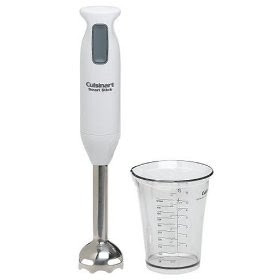 I got the Cuisinart immersion blender for a wedding gift and every so often when I'm pureeing soup I think about how it would come in real handy, but oh yeah - it's packed away and the battery has never been charged. Well I finally got it out from the depths of the pantry and charged it up so it would be ready to roll when I needed it. And oh how happy am I! I could not believe that it could puree an entire pot of soup in the blink of an eye. No more transferring hot soup, just a few cups at a time, to a blender and having to be so careful that the steam doesn't blow the lid off and get hot soup everywhere. No more having to dirty another bowl for the blended portion before returning it all to the pot. And no more soup drippings everywhere since I always work so quickly and end up with a huge mess. Just throw the sucker in, hit "on", give it a few whirls and voila, pureed soup. I am so crazy about this little gadget. I know. This baby is small, but it really works. I love mine too.